The place to go to get away from it all... Situated in the renowned Methow Valley at the foothills of the North Cascade Mountains, this private eco-retreat is nestled in a secluded basin of its own, at the end of the county road. The property's 160 acres of refuge is surrounded by thousands of acres of National Forest wild lands. The non-smoking Lodge features a charming, rustic wood interior with a handsome rock surrounding a fire stove. The radiant heat floor is covered with beautiful bamboo flooring. The deep, covered porch catches a breeze on hot summer days and is a great place to sit and relax. The cathedral ceiling and skylights in the 800 square foot living room provide an inspiring atmosphere for rest and renewal. There is an ample space for family and friends, but it is also a cozy setting for a quiet romantic get-away. There are three bedrooms in the Lodge (two with queen beds, and one with 3 twin beds), and 6 bedrooms (two twin beds in each) in the new passive-solar Bermhouse (two beds can be pushed together to make king-size bed, and modern IKEA cots to increase sleeping space by six more twin beds). There are three full bathrooms in the Lodge: one inside the lodge, and two with outside entries, one of which is with disability access; and three half-bathrooms in the Bermhouse. The wood-fired sauna offers a great way to relax after a day of hiking or skiing. Our two tents (small party tent next to the Lodge seats 25 people, large sky-lodge tent seats 100) offer additional space in summer, making it a perfect place for a picturesque wedding or a fun-filled family reunion. Hikes right from your door take in views of snow-capped peaks, and private groomed ski trails wind through the property in winter. There are numerous slopes to choose from for backcountry skiing, snowboarding or sledding. 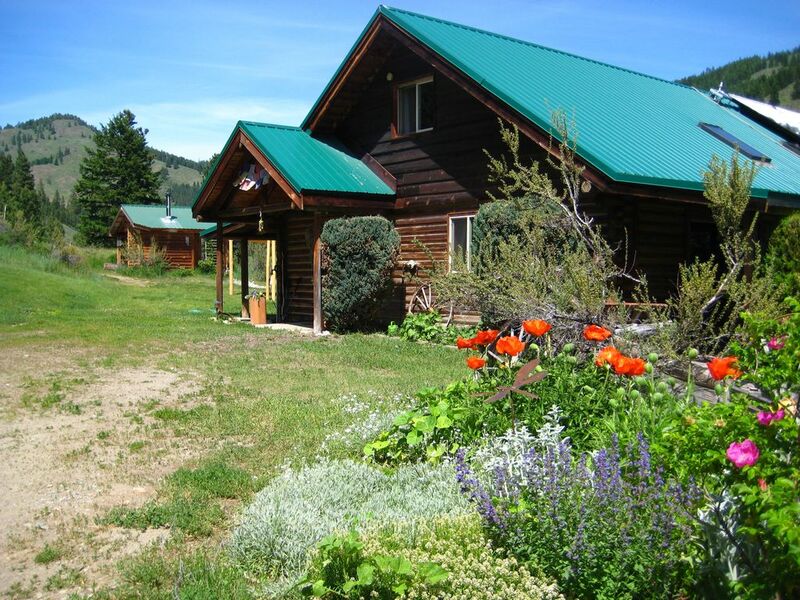 Nearby is the friendly Loup Loup downhill ski area, and the beautiful Methow River offers prime whitewater rafting. Springtime brings a magic carpet of wildflowers covering the land. Choose from several local swimming holes for cooling off in the summer. The town of Twisp offers live theater and a thriving Farmer's Market in the summer, natural food store, music throughout the year, an art gallery, restaurants, and more. Located on the sunny side of Washington State, close to mountain lakes and whitewater rivers, recreational opportunities abound. Note: This eco-retreat is completely solar-powered! It operates just like normal for the most part, except we can't handle crock-pots, hair-blowers and curlers, and we have non-electric means to make coffee, with thermoses to keep it warm through the day. We strive to be environmentally friendly, by recycling and composting food waste, and we encourage our guests to do the same! Skalitude Retreat owners live in the cabin on the property, around the corner from the Lodge. Skalitude Retreat is a destination in and of itself, a world away from the hustle and bustle of the cities. 7 miles of corduroy-groomed ski trails right out the door! The place to go to get away from it all... Situated in the renowned Methow Valley at the foothills of the North Cascade Mountains, this private eco-retreat is nestled in a secluded basin of its own, at the end of the country road. The property's 160 acres is surrounded by thousands of acres of National Forest wildlands. The non-smoking Lodge features a charming, rustic wood interior with a handsome rock surrounding a fire stove. The radiant heat floor covered with beautiful bamboo flooring. The deep, covered porch catches a breeze on hot summer days and is a great place to sit and relax. The cathedral ceiling and skylights in the 800 square foot living room provide an inspiring atmosphere for rest and renewal. There is an ample space for family and friends, but it is also a cozy setting for a quiet romantic get-away. We collectively had an incredible experience utilizing this magical space for our yoga retreat. There were a couple of hiccups in the beginning that the new groundskeeper, Andrew, was extremely quick and helpful in taking care of. In fact, Andrew was an incredible part of our overall experience. He was timely, friendly, incredibly informative and a true treat to have around. The lodge space and the bermhouse were loved by all. We had the fire in the lodge and the sauna stoked constantly, and it kept us all beyond cozy. Folks raved about the comfortability of the beds, and those camping out in the field were so pleased to wake up to the epic landscape each morning. The night before everyone left, they begged us to have another retreat here and we couldn't imagine NOT taking advantage of this remarkable, affordable space in the future- hopefully that is sooner than later! After speaking with Andrew about the prospective direction of the property under this new ownership, I am very excited to see what they do with this stunning land. It seems like Skalitude is in very good hands. Beautiful acerage, perfect for walks. We brought dogs and they frolicked freely and loved it there. We had a family reunion, a gathering from both sides of the state. It was a perfect place to gather, take walks together, play games, and unplug. This worked fairly well for us as there was a room at ground level and a fairly accessible bathroom for my husband in a wheel chair. As there was a step into each house entrance, this would not have worked with an electric wheelchair unless you brought a portable ramp with you. With the versatility of the sleeping arrangements in the berm house, it was able to accommodate the 16 of us here for a memorial service. The kitchen was well equipped and met all our needs.The view and hiking trail were great bonuses and the caretakers were great helping us with all our needs. I stayed here with my family over a winter break. The snow was wonderful and it was great to have a private area to enjoy all to ourselves. We ended up killing dozens of wasps that found their way into the cabin. My son and mom both got stung. The staircase was dangerous for little kids and the wood burning stove was the only source of heat. Not ideal for a family vacation. when we first started renting over 10 years ago we made a point of mentioning the staircase to families with little kids. Since then we have hosted so many families who didn't have a problem with it that we have let that fall by the wayside, perhaps we should put it back on the list. We do have a baby gate to put across the bottom of the stairs, maybe you didn't see it? I am surprised about your response about the wood stove, we had a whole conversation about the radiant heat floor which is another heat source. I know during your visit the temperatures were down below zero, which does make it hard to keep any building warm! Luckily those temperatures are not the norm for us, typically the floor does well at keeping things comfortable. We checked in with you a couple of times during your visit to see if everything was ok, you never mentioned the wasps. We could have helped you manage them if we had known. February is the worst time for them, they wake up from their winter nap, but there are ways to deal with them. Why didn't you say anything at the time? We stayed here over the Christmas holiday with our family and enjoyed our time very much. Lots of fun hills to sled on with the kids, a zipline, sauna and space for the dog to run free. Would absolutely stay here again. Ski: Right out the door are about 7 miles of private, corduroy-groomed ski trails, plus numerous slopes for backcountry skiing or boarding. The Loup Loup Downhill ski area is about 25 minutes away, with 1200 vertical feet of family-friendly runs, I think a daily pass is still less than $50! There are also great nordic trails up at the Loup, you just need a Sno-Park sticker to ski there, one of the best deals around. Further north in Winthrop are the famous MVSTA trails, more expensive but always excellent grooming.